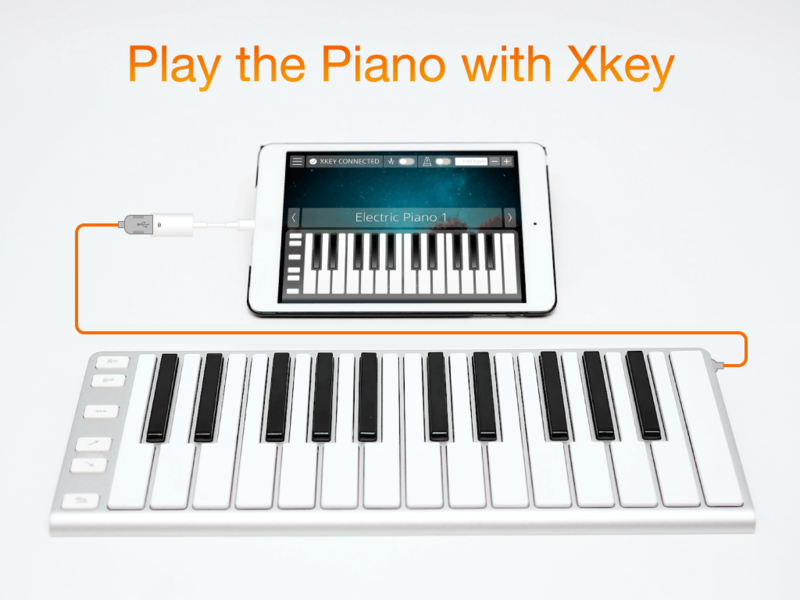 Xkey Free Piano App for iPhone, iPad, Mac, Windows, Android. Lots of music students and novices – young and old – like the portability and features of Xkey keyboards as a great way to learn music. And they’re reassured to see that Xkey is also the keyboard of choice for so many pro musicians, so students know their keyboard will be able to keep up with their growing musical abilities. Now to help people who are new to keyboards to quickly gain confidence in their abilities, CME has launched the Xkey Piano app. It’s a free app that’s available for iPhone, iPad, Mac, Windows and, in the near future, Android devices too. Learn how to connect and use your Xkey keyboard with a PC, Mac, tablet or smartphone. Select instrument sounds that can be played from the keyboard. Change the tempo and use the embedded metronome to keep time. Zhao Yitian, CME’s CEO, says: “Xkey Piano is perfect for novice keyboard players. With no prior knowledge of computers, apps or music, our plug & play app works right out of the box. Within minutes people can be playing notes and experimenting with various effects. The Xkey Piano app will also help first timers to make a more informed choice about which third-party MIDI music app they are likely to upgrade to.” Zhao adds that many new features are planned for the free app, with automatic upgrades via the various app stores. PreviousPrevious post:Musik Messe 2015, Frankfurt. Meet the Xkey Team. Hear Jordan Rudess.NextNext post:How Pro Musicians Use Xkey. Jordan Rudess. Please, application xkey for android coming soon upload. I always waiting this application. I want playing piano with this application. Hey, The Windows link is broken… it gives me a 16KB invalid zip file despite reporting as a 13.3MB download. Same result in IE and firefox. Thanks for the notice. We just fixed the problem! I’ve teen trying to download the free piano app. http://www.cme-pro.com/xkey/XkeyPiano/XkeyPiano.exe.zip does not take me there. How can we do this? Hi, can you please try again? What didn’t work? The link is for Windows OS only. Still need help. Which of the possible downloads do you recommend that I use with my Windows 7 or iphone? i have downloaded Xkey Plus and Xkey Piano.exe. How do I connect them to play the keyboard? could you please start “Xkey Piano” and follow instructions? You will need to have you Xkey plugged into your PC before launching the application. Let us know if any pb please. I bought the xkey, but it doesn’t work with my android phone. On your website you said it’s compadible with grand piano – I bought it and heat synthesizer – I downloaded it. But the phone has no connection to the keyboard. Can you give me an advice, otherwise I have to send it back to the seller. The XkeyPiano.exe doesn’t work with my PC. It opens fine, and I go through the 4 screen steps until I get to the final screen where I click “Play NOW!! !” At this point, an error message pops up every single time that says XKeyPiano.exe has stopped working. could you please give me your Windows version, as well as your XkeyPiano version? I downloaded the SW to my ipad and read the settings instructions — but how do you turn on the keyboard???? Help! Thank you. Have you plugged your Xkey to your computer or iPad using the USB cable? Please contact us through our contact form. Hi, can Xkey work with my iPhone 5? If i get the camera accessory cable: mini USB to lightning, will it work with apps like GarageBand/Animoog etc? yes it will! As long as you have a USB adapter for your iPhone, the Xkey will work fine with GarageBand and a lot of other MIDI compatible apps. I bought the XKey 25 recently and I would like to start using it. I have downloaded the XKeyPiano.exe for windows however, after I launch it and get to the 4th stage, the installer crashes. This happens every time. Hello, thanks for the notice. We just uploaded the new XkeyPlay version for Windows, could you please try again? Thanks. 1. I am unable to install the windows xkey piano programm. Error massage: your windows (7) version does not comply with the programm, and it asks wether I have a 32 or 64 bit version ? …Answer : WINdows 7 professional 32 bit Service pack 1. 2. I would like to connect the Xkey to my Samsung tab 2 tablet, but wonder what cable (provided cable is not the needed one) and programs I need . thanks for the notice, we will check the Xkey Piano installer for Windows 7 and get back to you. Let us know if any pb. My XKey piano will not work. I’ve dowloaded the software, loaded it (it worked), plugged in the piano (it says it’s connected) and yet no sound comes out of it. None of the buttons on the left work. Did I get a defective keyboard? If so how can I tell? please send email to techsupport@cme-pro.com with more details. We will help, thanks. Hi, can you please send us a message at http://www.cme-pro.com/contact/ with your contact details and OS version ? Thanks in advance. Hi there, I have tried to run on two PC’s without success. Says wrong windows version. One PC is running Windows 7 32bit and the other is running Windows 10 64bit? the Xkey Air is only compatible with Android 6.0. If you want to use with old version, you need our WIDI BUD (www.widibud.com). Your Cme Xkey for “Android” will come after landing of human on Mars? Please tell me. my new Xkey 25 does not works on an Android Lg G2. The phone reconnize the keyboard and many apps shows I press keys on the keyboard but I can’t ear any sound from phone. I tried many times. When I connect keyboard to phone it stop every sound. Can you help me please? Do you mean if you touch the screen, you can hear the sound; but if you play the Xkey, the sound was silent? Please post this on our forum so that we can answer you quickly. I have an iphone 7 plus and I bought the lightening to usb converter to connect my cme xkey. How do I get an audio out ? Bluetooth speakers have latency issues. Pls help.